Appliances are used during various stages of the orthodontic process, either to retain the new position of teeth, or in some cases to influence the growth of the jaws for a better bite alignment. Appliances may be fixed or removable. 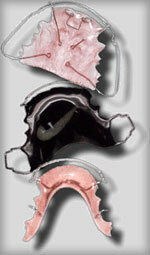 Retainers: Used after braces are removed to hold teeth in their new positions. You must wear your retainer as prescribed to prevent regression of your treatment. Herbst® Appliance: Used to correct overbites, this fixed orthodontic appliance is typically used on younger patients. Palatal Expander: Designed to widen your upper jaw, a palatal expander applies outward pressure on your upper molars to slowly expand your palate. Spacers (Separators): Spacers are plastic rings that are inserted between back teeth before you have braces, providing space for your teeth to shift. If a spacer comes out, call our office to see if you need a replacement. Do not chew sticky foods with or floss teeth that have spacers in them. Elastics (Rubber Bands): Rubber bands are used with fixed metal braces. They must be worn at all times and changed daily per our instructions. Headgear: For a severe overbite or underbite, headgear is sometimes used to continuously pull on your teeth, restricting further growth forward. Positioners: Designed to complete the final tooth necessary movements, positioners are usually the last step in the orthodontic process. As with retainers, all orthodontic appliances should be worn as prescribed. They should be cleaned with toothpaste once a day, and if removed for eating or sports, they should be placed in their container, never in a pocket or napkin where they may be broken or thrown away. It is normal for new or recently adjusted appliances to cause soreness or a slight alteration of speech for a few days following your appointment. If you experience a sore spot on the gums, however, please call our office so that we can make an appropriate adjustment.